"Oneness" with the land is considered crucial to pleasing the All-Maker. The Skaal practice this concept by seeking harmony with their surroundings. For example, firewood is collected from dead trees. Hunting is for subsistence, not sport. The sanctity of life demands that violence only be used as a last resort. The Skaal draw power from the natural order (the harmony, or balance, of the land); when they are in harmony with the land, they are joined with it through the grace of the All-Maker, and when this harmony is upset, so is the All-Maker, and their power dwindles. It's believed the All-Maker cursed ancient warriors with undeath for committing acts of cannibalism, thus creating the draugr. Another legend says that when the All-Maker breathed life into the creatures of the land, his "Breath" blew through the trees as well. Some of these trees kept a part of this life, creating the spriggans. In times of great need, the Skaal perform a ritualistic hunt of blessing and cleansing that they call the Ristaag in order to demonstrate their gratitude to, and hopefully please, the All-Maker. They also practice the Ritual of the Gifts, a pilgrimage to perform certain rituals at each of the All-Maker Stones to restore Oneness with the land. Skaal often accredit the All-Maker with greater wisdom and power than deities which are part of polytheistic traditions. In opposition to the All-Maker is the Adversary, an equally enigmatic opposing force which works to corrupt the dominion of the All-Maker. The often-malevolent Daedra are treated much the same in the Skaal tradition as they are in Aedra-worshipping cultures, though they are presumably considered to be merely some of the many evil aspects of the Adversary. The All-Maker's mystique often leads to speculation on the connections the deity may bear with other known deities, such as Alduin. 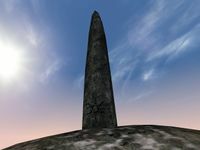 In the context of The Story of Aevar Stone-Singer, the All-Maker and the Adversary bear some resemblance to Anu and Padomay, who are in a similar antithetical conflict. ^ a b c Storn Crag-Strider's dialogue in Dragonborn. ^ a b c Dialogue of Skaal villagers in Bloodmoon. ^ a b Wulf Wild-Blood's dialogue in Dragonborn. ^ a b c d Korst Wind-Eye's dialogue in Bloodmoon. ^ Yrsa's dialogue in Dragonborn. ^ Nikulas' dialogue in Dragonborn.